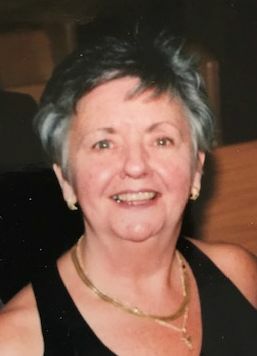 CURRAN, Diane F. (Holding), of Randolph, formerly of Revere, passed away peacefully on April 7, 2019, at the age of 74. She was a longtime communicant at St. Mary Church in Randolph. A devoted wife, mother, sister and grandmother, Diane will be greatly missed by all who were blessed to have known her. Diane was the wife of the late James Curran. Loving mother of Doreen Schott and her husband Russell of Northbridge and James Curran and Angela Baker of Raynham. Dear “Nanny” to Hailey and Russ Schott and Joey and Johnny Curran. Mother-in-law of Jacqueline Halpin Curran of Pembroke. Devoted sister of Carol Watson of Revere, June Burke of Billerica, Chris Holding of MT and the late William, Richard, Donald, Robert and Gary Holding. Daughter of the late George and May Holding. Also survived by many nieces and nephews. Relatives and friends are respectfully invited to attend visiting hours on Thursday, April 11th from 4:00 – 7:00 PM in the Cartwright Funeral Home, 419 No. Main St (RT. 28), Randolph. A funeral Mass will be celebrated on Friday, April 12th at 10:00 AM in St. Mary Church, 211 No. Main St., Randolph. Burial will follow in the Blue Hill Cemetery, Braintree. Should friend’s desire, memorial contributions may be made in her name to Meals on Wheels, c/o South Shore Elder Services, 1515 Washington Street, Braintree, MA 02184 or to Rosie’s Place, 889 Harrison Ave, Boston, MA 02118.